Yes, I've indicated that this is a busy time. Straight after the Lost Legion DBA it was back up north for the Manchester spring round of the Northern Doubles. Field of Glory for me. 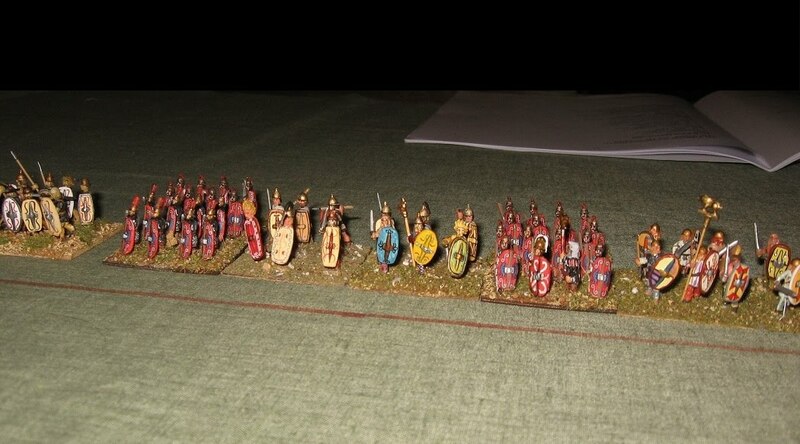 So, putting the Armati aside and the DBA aside ... what was left in the Field of Glory bag? Well a big dumb version of my Condotta Italians, for starters. 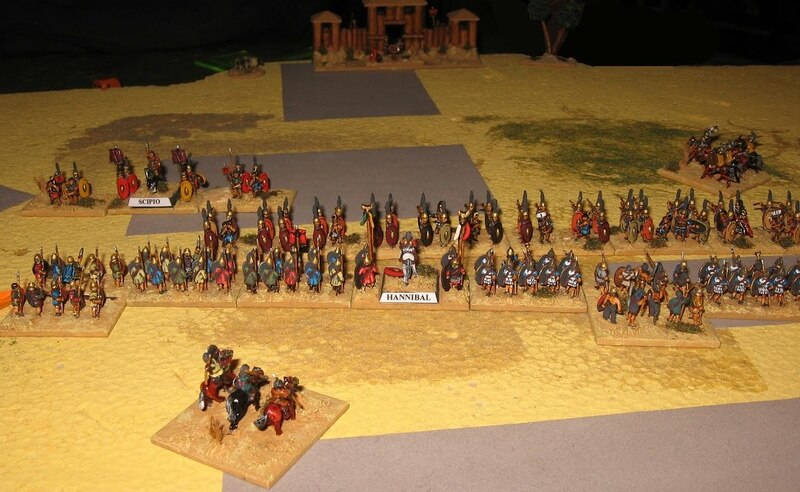 The NDBML uses a handicapping system: armies are graded from 1 to 3 depending on how many supertroops and Inspired Commanders you have. An army of elite and superior troops with an IC would be grade 1. An army with none of either would be grade 3. 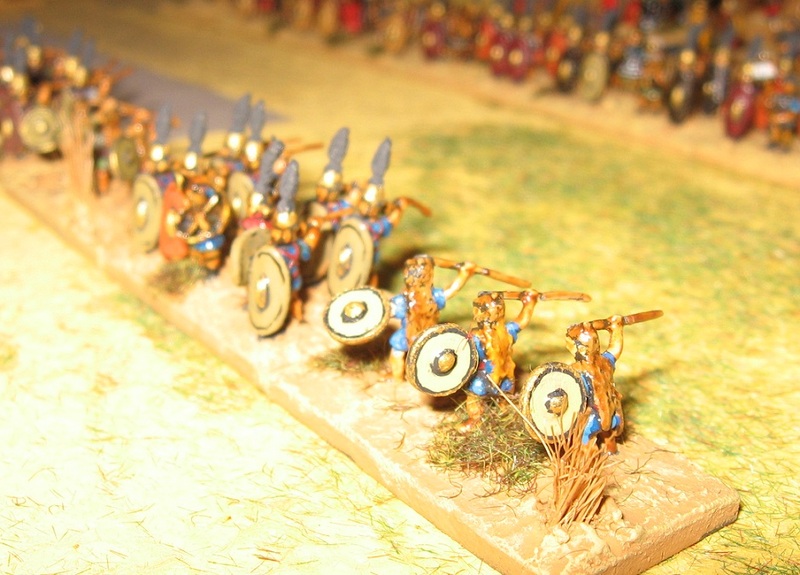 Having more than 15 battlegroups shuttles the army up a grade. Teams need to use one army from each grade during the year, and score some extra points by winning above their rating. 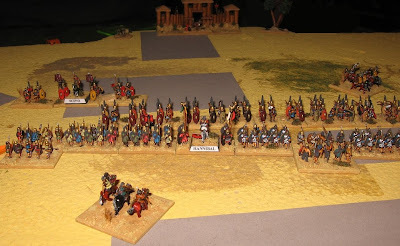 As my Italians have no superior troops anyway (and I am not a smart enough player to benefit from an IC ....)... they are a natural for a Grade 3 ... Just usually I have a few more battlegroups (16 at 800 points, 18 at 900). So it just needed dumbing down to 15 for this outing. The two games on offer produced the alpha and the omega of open competition. 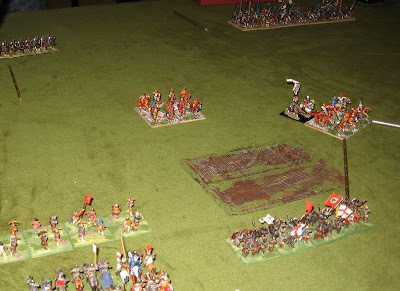 Game 1 was against Les Mitchell's Early Successors (Medieval Knights vs Hellenistic pikes!) .... Game 2 was against Colin Betts's Hungarians. So one completely out of period and one completely plausible in period. No criticism of the players, we had a good enough game, and everyone played nicely ... just it is very much an academic exercise, it isn't a proper wargame. 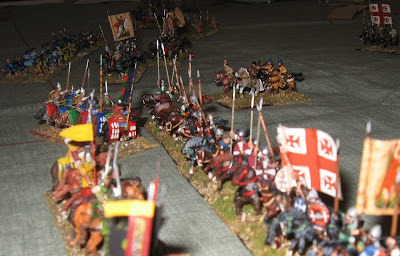 Against the Hungarians, of course, we had a swirling cavalry engagement, our flanks enveloped but our knights resilient. 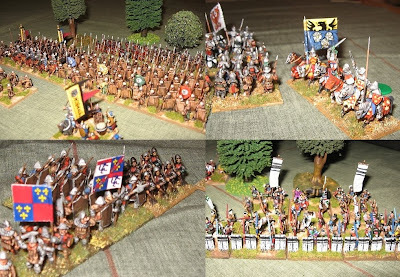 The Hungarians have better knights - just about - but we have more. All the Condotta knights are drilled, so are better able to control their charge ... but, for reasons that are better left to a different forum, FoG rates them as average, so they aren't that reliable once they start taking Cohesion Tests. 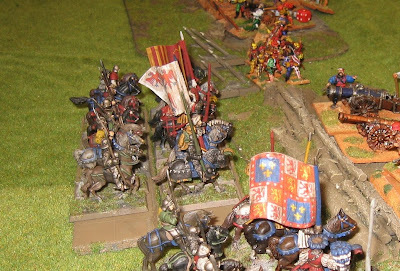 It is also worth saying - rightly or wrongly (and that is debatable) - that FoG rates the crossbow as primarily useful against cavalry (worse ... would you believe? ... than a 'bent bit of wood' bow against most infantry!). 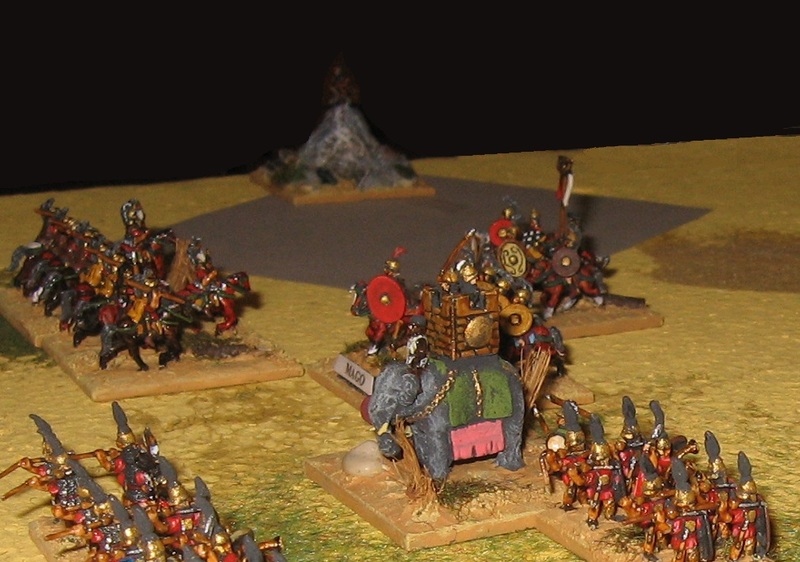 The Italians, other than the knights, are predominantly crossbow-armed. 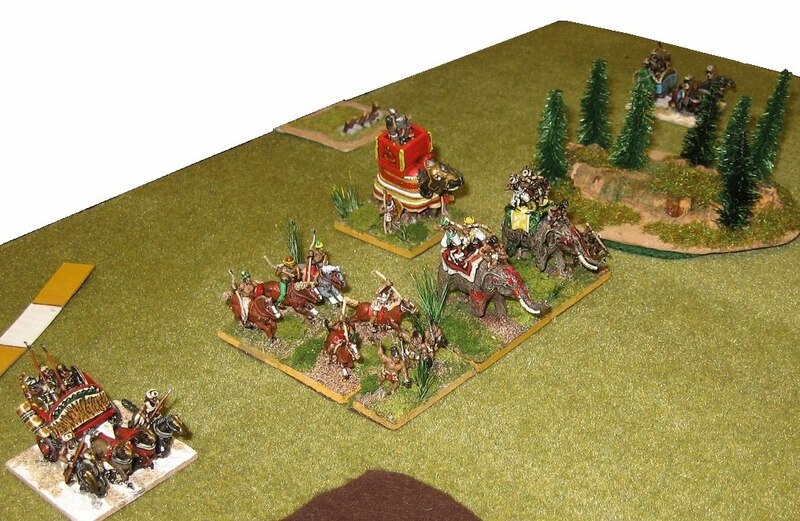 So the army is optimised by the rule writers against cavalry, not foot. So, bad news against Les, good news against Colin. We had a colossal clash of knights in the latter. About 100 knights in one big clash, with half the generals on the battlefield bundling in. My long suffering doubles partner, Chris, threw some wonderful dice, and passed some improbable tests ... Colin didn' ... and didn't. 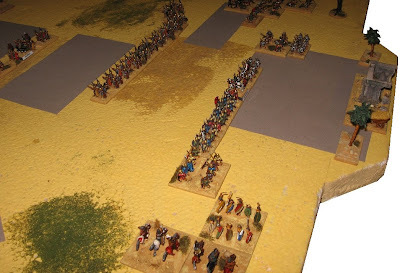 So, yes, of course there was a lot of luck involved - then again, we used our advantages of better drill and bigger units reasonably wisely, so have no complaints when it works. These one day FoG bashes are great value and well worth the trip. The Northerners are always very welcoming, and always give a good game (pitched competitively if you are a seasoned player, helpfully if you are a beginner) - have a look at the Maws page ... you might find one that's handy for you. Well ... Battle Day next ... Hmmm, I wonder what Rick Priestley's 'Hail Caesar' will be like (and who will have the baggage coming up with Pre' ?)? 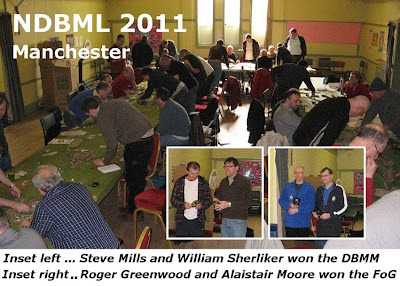 The Society of Ancients UK DBA League came in to being late last year in discussions which followed the English DBA Open. The appetite for 'one-day' DBA events seems consistent, and linking such events together an obvious 'next step'. The Lost Legion is one of several new events that have emerged in response to the idea of a Society sponsored series. 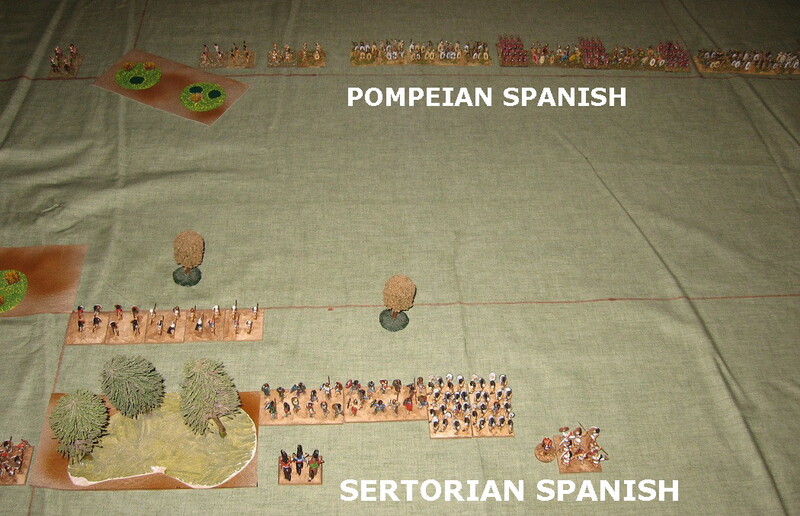 This gave me something of a problem - I am a 'cross over' from DBM, so I don't have lots of little armies in matchable pairs (I have quite a few big armies without the specific opponents that DBA - sometimes idiosyncratically - lists as appropriate) ... Where I have opposing forces, these are historically constructed (and my categorising/basing doesn't always match the DB classification). 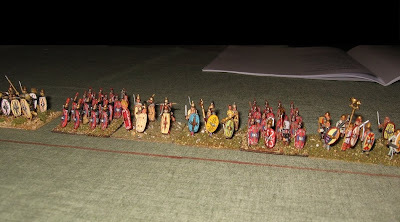 Where I do have smaller armies, they are based-up in double depth for Armati (or are genuinely smaller, like my 10mm)! It took me a while to get my head around this problem. 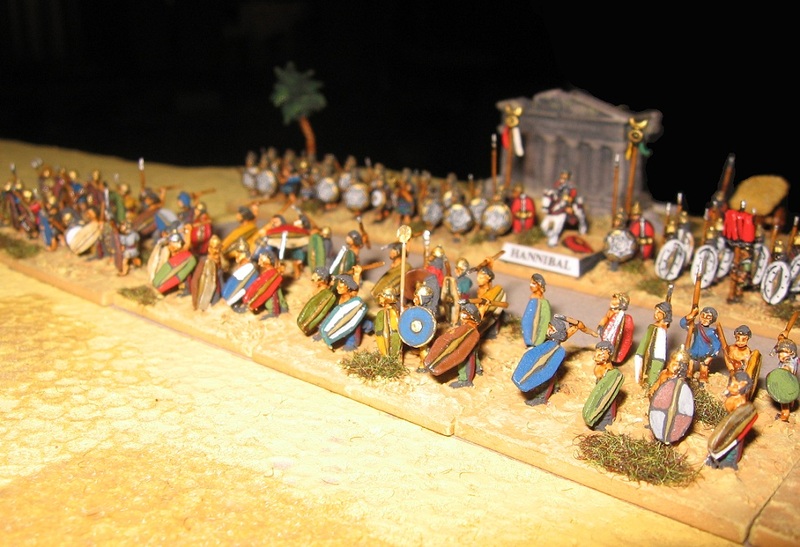 As I have several thousand 15mm figures in only a few period bands, it seemed obvious that finding an interesting and compatible pair amounting to just 24 elements ought to be straight forward. Ought to be ... but isn't! In the end I opted to go with my favoured Crusades period, and a fairly adaptable Syrian army. I thought that the 5 Spears in the obvious opponent for the army (i.e. 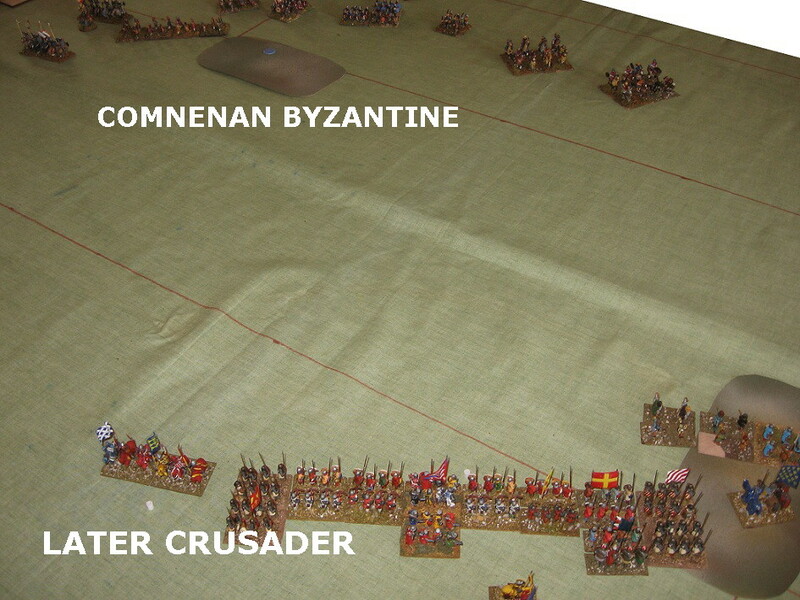 Later Crusader) was potentially a bit stodgy (for a quick-fire game schedule) and, in truth, not especially typical of Crusader armies of the period. 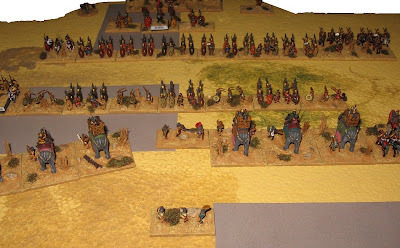 A plausible 'in period' enemy for the Syrians (though not listed in the rules), the Lusignan Cypriot looked a bit more attractive to play with, so I decided on that as the other half of the pair. 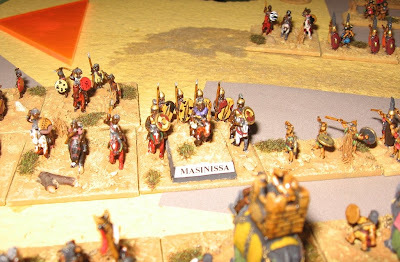 I clearly judged well, as all my opponents thought the Cypriot army looked attractive ... so picked it and beat me with it. Hmmm. The joy of this is that you only have yourself to blame ... I got my own game three times, was given the Syrians each time and lost the match 3 - 0. I played my opponents' games 3 times, and won that rubber 2 - 1. I hold my hands up at that. I have always been prepared to admit that I am far more bothered about historical content and military interest than ever I am in play balance. Well, I should add, that I'm not putting that forward as an excuse ... my opponents played well in all 6 games and I could have expected no better than 2 or 3 wins. I enjoyed all 6 games though I must say that the opener against the well tutored martin Smith was something of a fools mate ... I lumbered myself with a BUA which I couldn't defend adequately, Martin got it on his side of the table and quickly went 3 up. 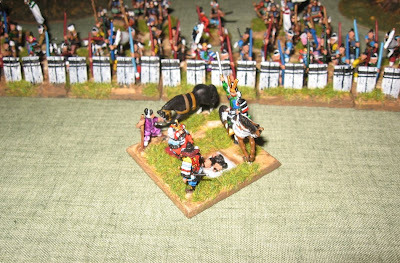 I lost the fourth valiantly trying to kill his general as the only real option given the BUA handicap. Without taking sides (haha!) I fully understand why so many people consider the BUA rules to be stupid. 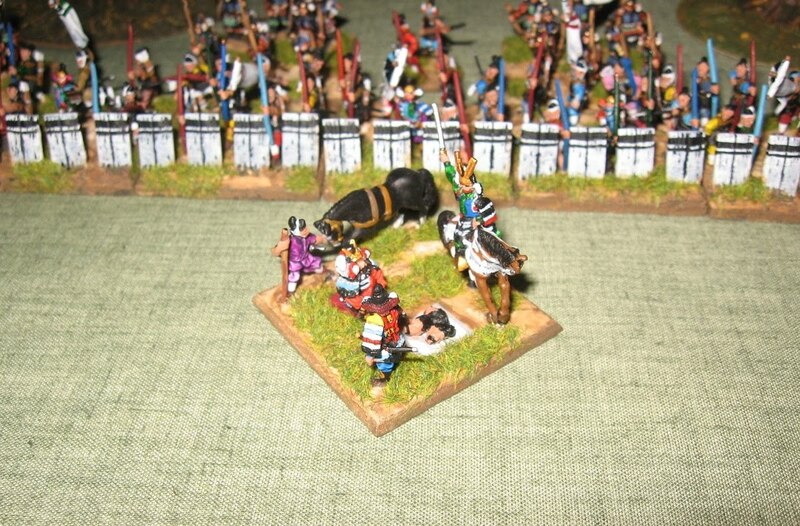 Each to his own, of course, but I can't think of much historical justification for the arable set up or the way the BUA works in the game (most historical battles just don't work like that). Silly. 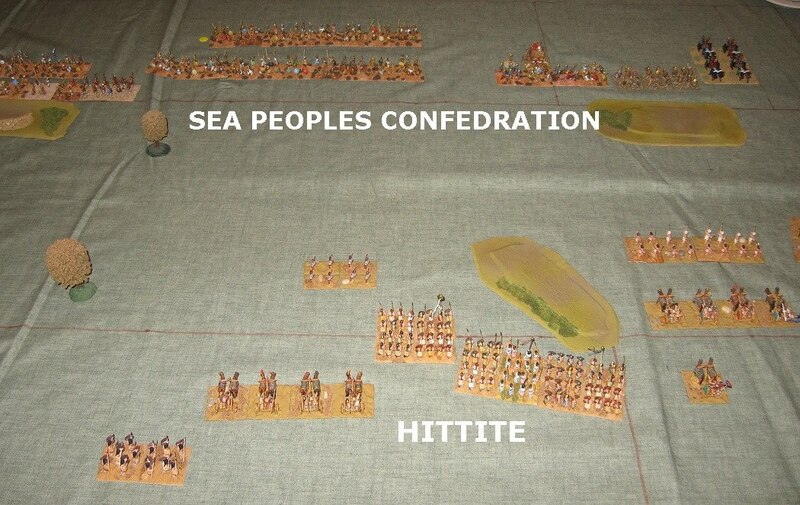 Somewhat more fortuitously, although I did include a naval baggage element for the Littoral Lusignans (so geared them up for all sorts of landing options) ... all the games were in arable Syria (so the road or BUA nonsense prevailed) ... Still, the ship is a pretty piece of decoration for the army. 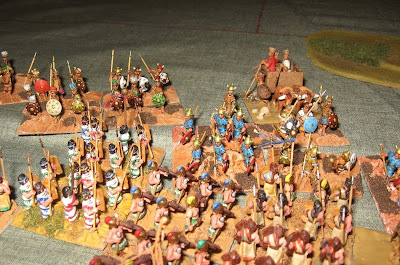 The away games I got were Ptolemy Keraunos against the Galatians, Lydian vs Medes and Hittite vs Minoans. A good mix, given the Crusader period that was my home game. 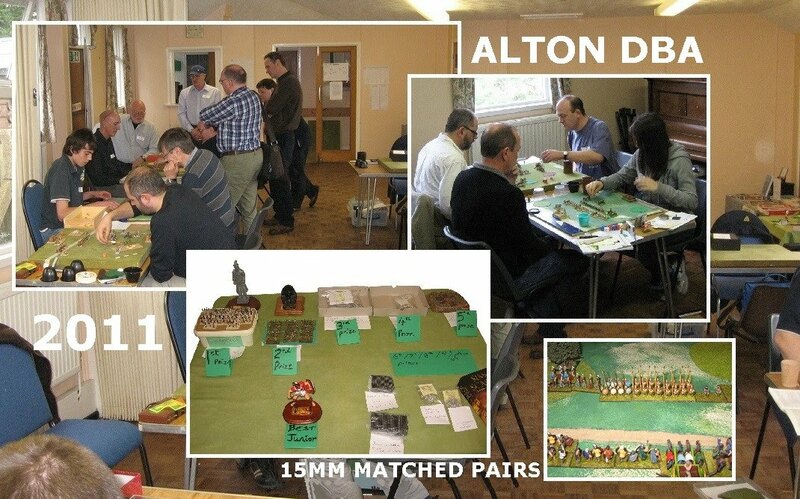 As ever, I met some new enthusiasts, learned a few more nuances of the game and had an enjoyable day out. 1 Colin O'Shea 102 points; 2 Adrian Webb 98 points; 3 Matthew Bennett 98 points; 4 Martin Myers; 5 Martin Smith; 6 Bill MacGillivray; 7 Duncan McCoshan; 8 Patrick Myers; 9 John Drury; 10 Scott Russell. 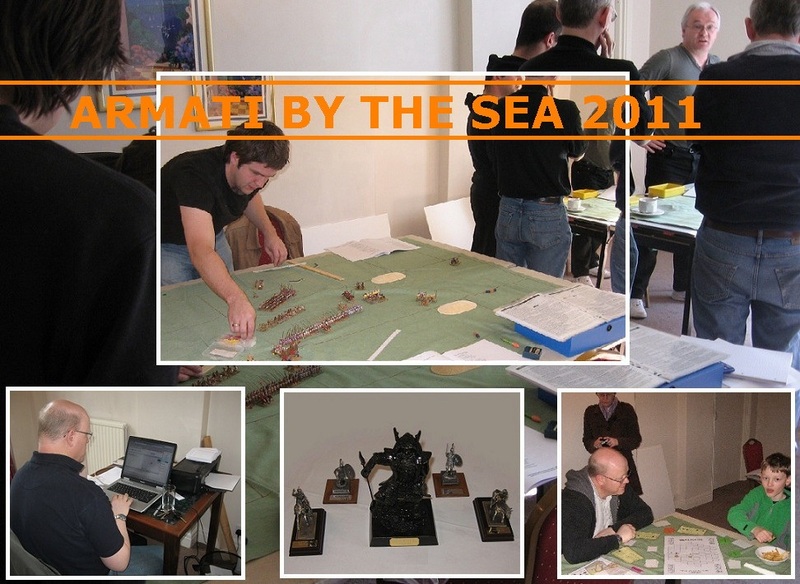 The other ten players on the day were, in no particular order :-David Constable, Luca Blasi, Peter James, Mark Skelton, Phil Steele, Gordon Frater, Ray Briggs, Denis McManus, Tim Moore, and Aislinn Smith. Peter Barham's Society of Ancients sponsored spring Armati event has become an excellent regular feature, these days ... and I was back this year as defending champion. I may as well get that bit out of the way now, as it became pretty quickly clear on the opening day that I was not going to get lucky two years running (and that obscurity was once again opening her welcoming arms to receive me).. The formula for the event is that, courtesy of Roy and Mark, 52 preset armies are provided by the organisers in 26 historical pairs. These are marked as (a) and (b) on a coin, and the coins are shuffled together in a bag. Each round one of the players from each match draws a coin to be allocated the game, then tosses it to see who plays which side. A great idea, I'm sure you will agree. I drew Sassanid against Ian Kerr with White Huns (Scenario #17); Assyrian against Stuart Campbell with Medes (Scenario 5); Sertorian Spanish against Mick Owen's Pompeians (Scenario 10); Hittites against Richard Jeffrey-Cook's Sea Peoples Confederation (Scenario 3); and Later Crusader against Craig Tannock's Comnenan Byzantine (Scenario 23). So a good mix for me ... Something Biblical, something Medieval ... and not a pike phalanx or Samurai in sight (a little 'in joke' for the benefit of the UK Armati fraternity, there - apologies to the rest of the world ...).. Very few players can even aspire to have as extensive and diverse a collection as Roy and Mark can put together, and one of the great joys of the Bournemouth formula is getting to play the numerous areas covered by Armati that your own collection doesn't cover. There is always something new up for grabs. As a veteran player of these games, I know it will come as scant compensation to those who got on the wrong end of my good dice to know that this happened somewhat infrequently during the weekend (I lost most of the games and was never really in contention ...)..
Winning or whining is less important, of course, than wining and dining and the 'all in' Chinese on the Saturday evening was its usual sumptuous self. We were able to contribute meaningfully to Bournemouth's recycling targets by emptying several large and dozens of small bottles for them during the course of the weekend - bottles which otherwise would have been out of circulation, idly full of wines and beers. Indeed, some of the wine bottles had been out of circulation for many years, so it was particularly helpful of us to empty them and return the glass to other uses. There was much talk this year of how to get the slow minority to speed up a little (the schedule of games - which allows for 3 on the Saturday - is clearly not hurried, as nearly all of the games finish within the allotted time ...)... and it may be that next year's event will feature a new scoring system placing more emphasis on winning before the clock runs out. A great weekend as usual - hopefully, it will not clash with Alumwell next year, and we can do it all again. I took many more photos, and plan another entry shortly which will just be a tour round the marvellous collection of armies put at everyone's disposal for enjoyment over the weekend. 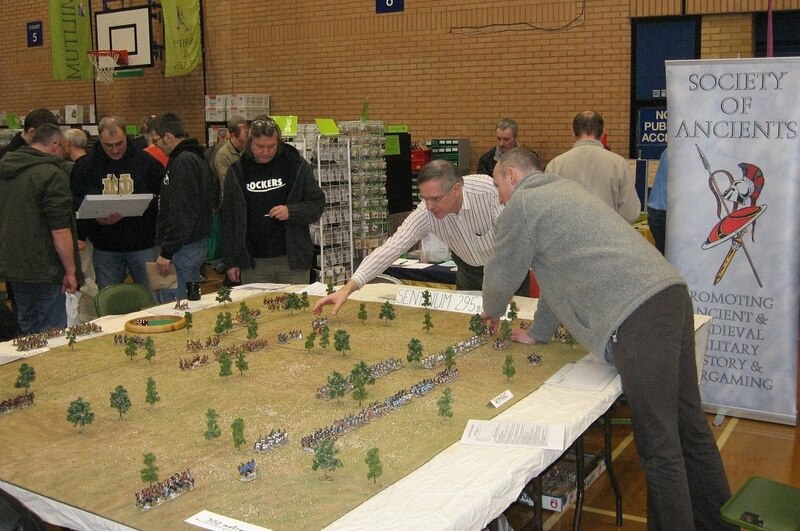 Thanks on behalf of the Society of Ancients to Roy and Mark for planning and transporting everthing, Peter for masterminding the event and to all the players for their support. A busy weekend, this one. 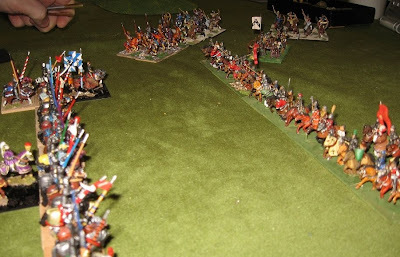 As sometimes happens with the moving feast of Spring Wargames shows, the Shows North team was double-booked (and I was attending the SoA sponsored Armati event down in Bournemouth). 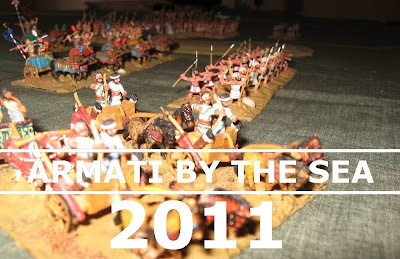 Now I don't want anyone to feel I was being disloyal to my 'North and Midlands' brief, here ... truth is, with the events not clashing last year, I attended Armati by the Sea last year ... and, fortuitously, won. You will appreciate two things here ... it would be bad form not to go back and defend my title ... and it doesn't happen very often (so any precedent set is likely to be pretty innocuous ...). 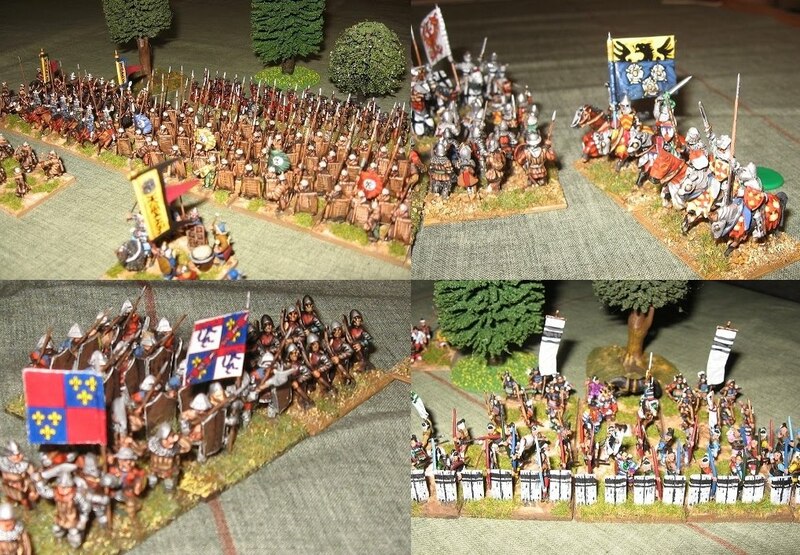 Graham took along the usual Society of Ancients gear, plus a DBA version of the battle of Barnet using his decorative 28mm Wars of the Roses collection. 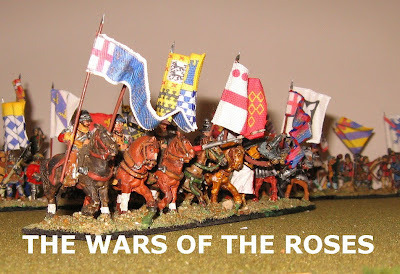 We'll be seeing quite a lot of the Wars of the Roses this year, I think. 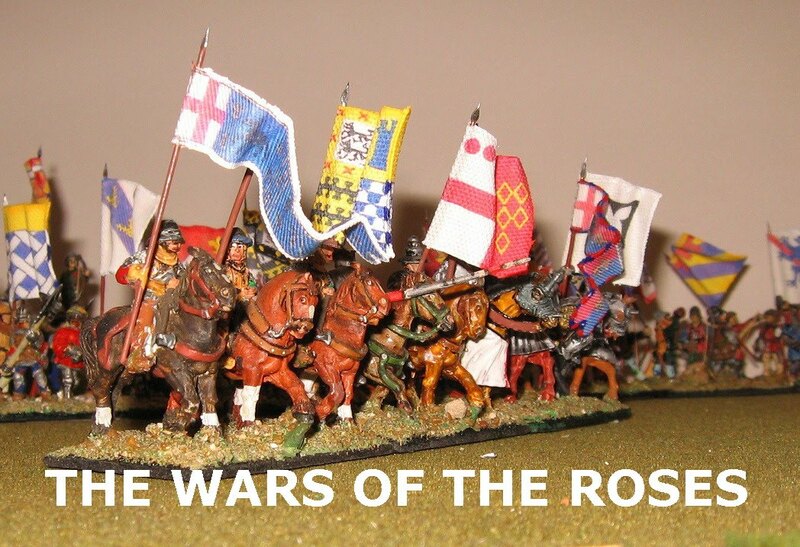 550 years ago, on Palm Sunday, the bloodiest battle on English soil was fought on the snowy fields of Towton in North Yorkshire. I understand there was a suitably chilly display at Alumwell which I hope I will catch up with during the course of the Shows season. 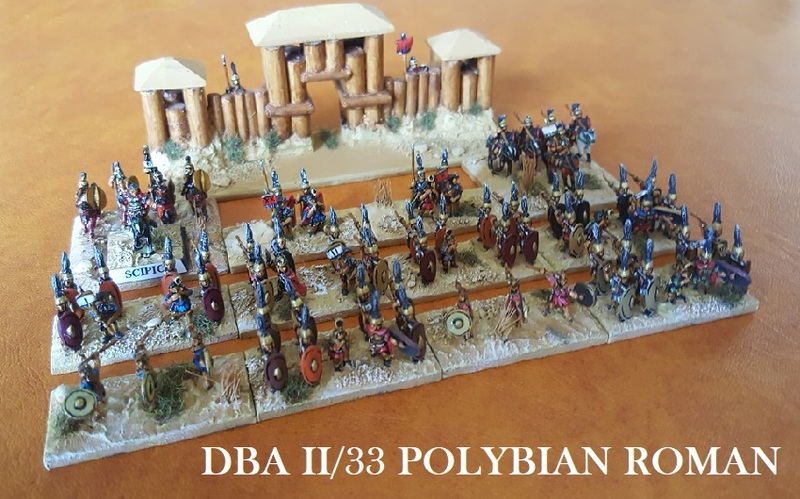 A while back, I promised a fuller report on my 'double' DBA Zama game, and more pictures of the 10mm armies I built for it. 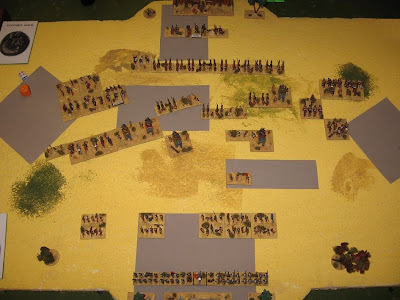 This is a top down view of the battlefield. 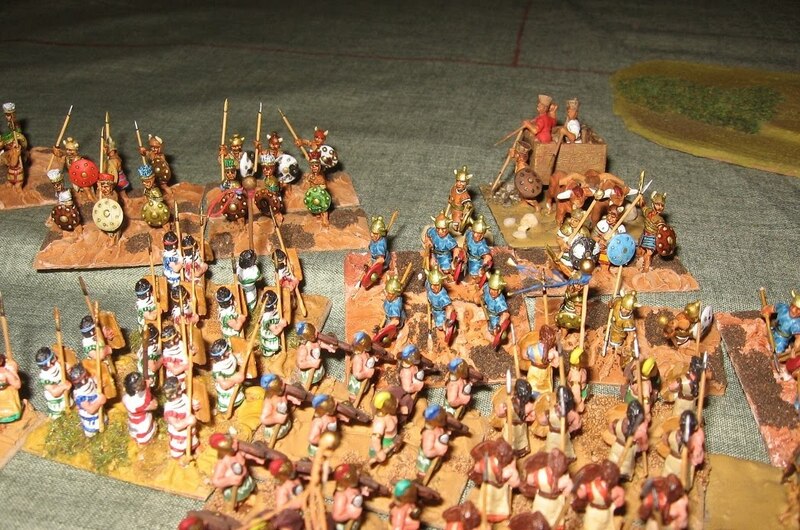 As can be seen, each player has two 12 element DBA armies, one deployed in fron of the other (rather than side-by-side, as is more common in 'big battle' variants). The red and blue lines, at left, indicate the notional four deployed lines of battle described at Zama (in this case amalgamated to three - though 10mm does allow a line of figures to be shown). Double DBA ... 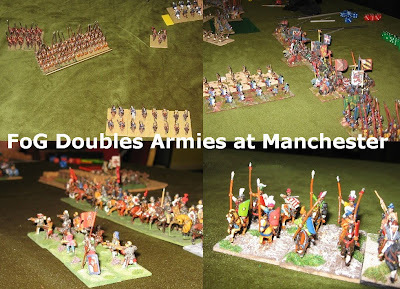 Double DBA is a straightforward idea (though not one I have seen before) ... each side has two standard (12 element) DBA armies, but instead of deploying them side-by-side (in the usual allies or 'doubles' format), one deploys in front of the other. 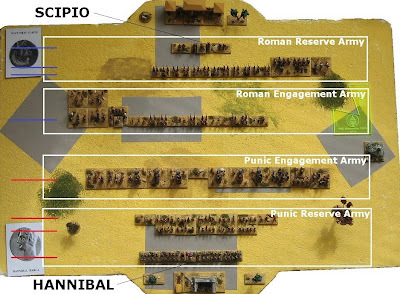 The game is won when either reserve army breaks by losing 4 elements or its commander. Remnants of the engagement army are not part of the reserve force so do not count in this analysis. 2 Sp, 1 Sp Gen (Hannibal), 2 Sp. 1 Ps, 1 Bd, 1 Ps, 1Bd, 1 Ps, 1Bd, 1Ps, 1 Cv gen (Masinissa), 2 LH with 2 Ps deployed in a supporting rank behind the LH. 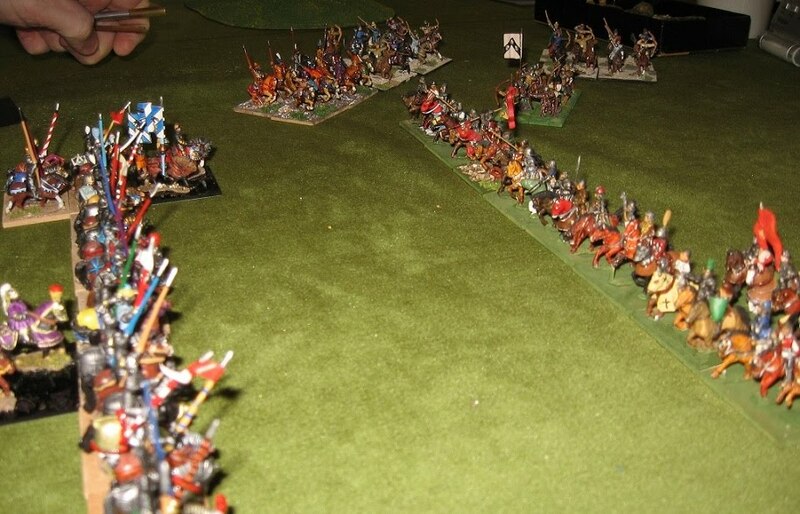 For DBA completeness, both armies were given a camp behind the lines, but they cannot be 'taken' in the game. 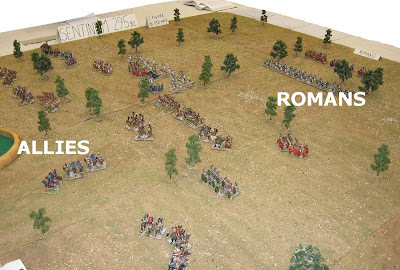 The battlefield is a flat open plain with no terrain features in play. This year's Battle Day is in Bletchley, on 2nd April, and features the great showdown between the Egyptians and Hittites at Kadesh. 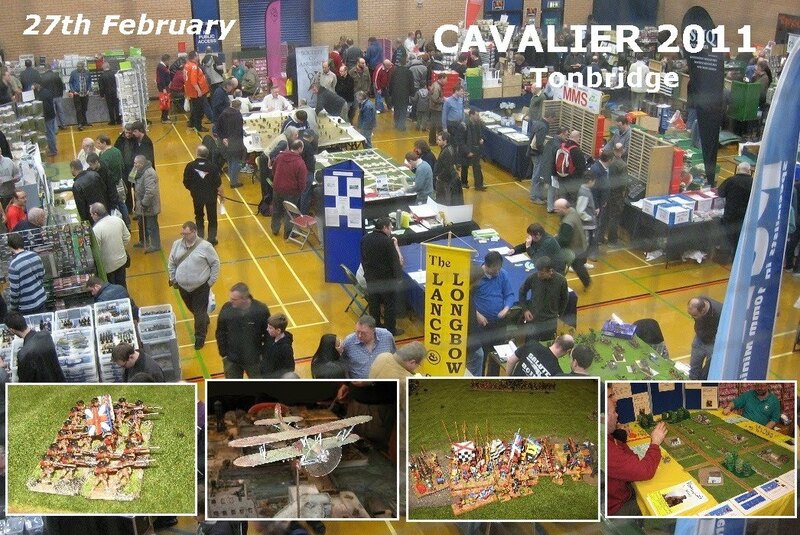 I was pleased to drive over to Tonbridge the other weekend, and join the Society's 'A' team for this year's Cavalier. At least, I assume they enjoy it ... as they never fix it. I come from the East Midlands, where, on a Sunday morning, we prefer just to drive up, park and go about our business. Going by car somewhere where you can't park, on a Sunday morning is something I just don't 'get' - but it is very popular in Tonbridge. 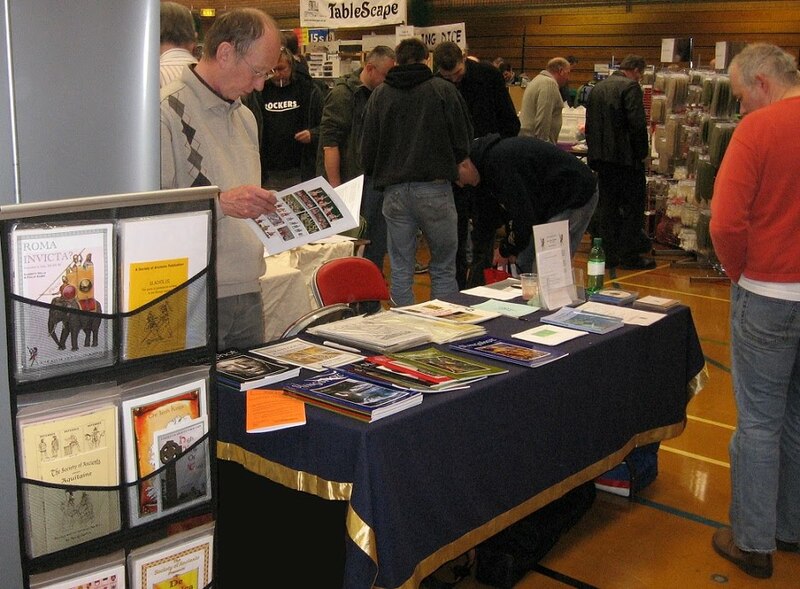 I was delivering supplies of the newly printed January issue of Slingshot (the first issue of the new subscription year) which we were proud to show off to the public - slightly different, this year, as we have gone for the 'lie flat' stapled option. 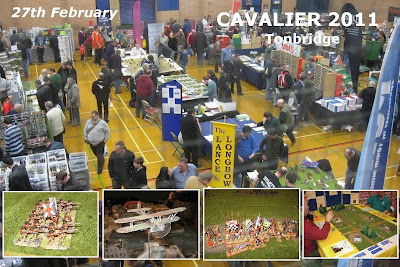 At Cavalier, we also launched the latest 5 yearly upgrade of the Slingshot Archive DVD - now of course containing every Slingshot from 1965 to 2010 ... an invaluable resource of over 13,000 pages about ancient and medieval history and wargaming. Fully indexed and requires Adobe Acrobat Reader version 7.0 or later. To showcase historical wargaming in the ancient and medieval periods, at Cavalier Phillip Sabin put on the battle of Sentinum using Lost Battles. At Sentinum, in BC 295, Rome took on and defeated an alliance of Samnites and Gauls on a flat plain in Umbria ... Eric Cruttenden and Alan Waller helped stage this in 28mm. ... and the Budapest game won best demonstration game. There were quite a few planes, boats, trains and other interesting stuff, and a wide range of scales and styles of game being played. 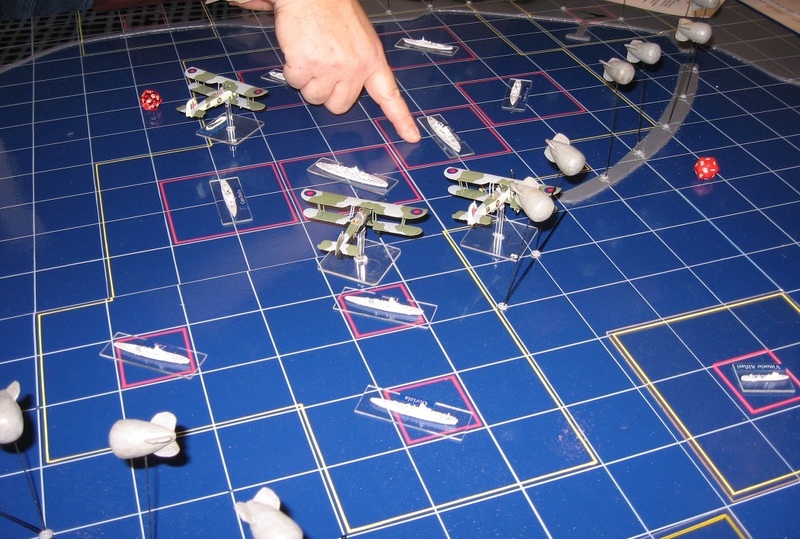 I quite liked the Stringbags at Taranto WW2 game (which looked great, and seemed in play all day long), but you will have to follow the links provided to see more. 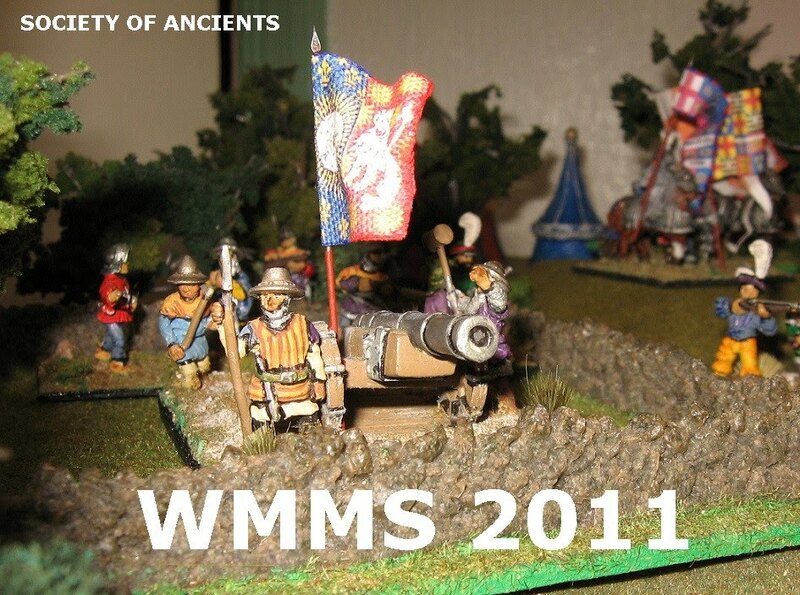 Graham F will be covering WMMS for us with a DBA medieval game while I am away playing Armati in Bournemouth. It is a pity to miss such a good Midlands show, but against all odds, I won something in Bournemouth last year - so feel duty bound to go back and defend my title!